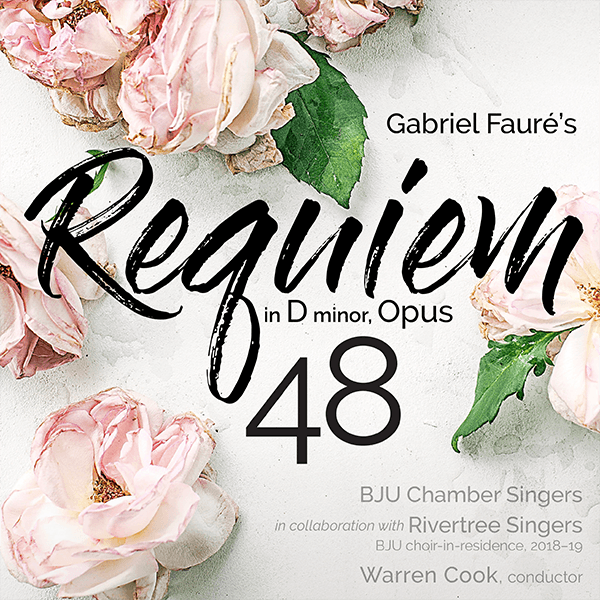 The BJU Chamber Singers, Rivertree Singers, and chamber orchestra are performing Gabriel Fauré: Requiem, Op 48 under the direction of Warren Cook. This collaboration with Rivertree Singers is part of the 2018-19 choir-in-residence program in the Division of Music. Additional selections for the program include Purcell’s Hear My Prayer, O Lord, Vaughan William’s O Taste and See and Harris’ Faire Is the Heaven. The performance will be in BJU’s beautiful War Memorial Chapel, Saturday, April 27, 7:30 pm. This benefit concert is sponsored by Rivertree Singers. All proceeds from ticket sales will go to the BJU Music Scholarship Fund.